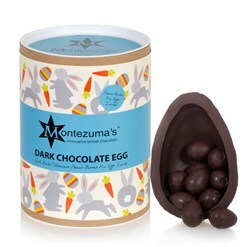 From simple filled mini eggs to seriously connoisseur...we have something for everyone. 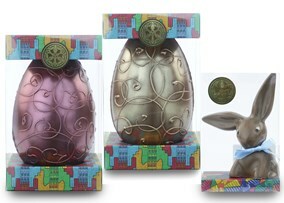 A fine dark chocolate Easter egg including 6 of our superior selection dark chocolates. Made with only high quality ingredients with no preservatives or artificial flavours. Presented in a beautifully stylish gift box. Available in small and large. 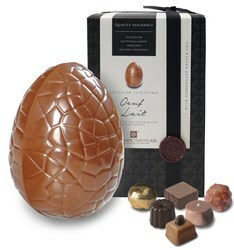 A fine milk chocolate Easter egg including 6 of our superior selection milk chocolates. Made with only high quality ingredients with no preservatives or artificial flavours. Presented in a beautifully stylish gift box. 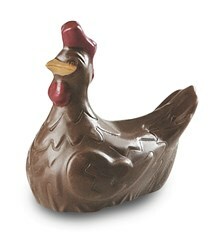 A superior quality, milk chocolate Easter hen, decorated with coloured chocolate. Presented in a gift bag with brown satin ribbon and Happy Easter gift tag. 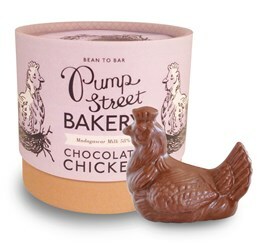 A single origin, milk chocolate chicken hand-crafted using award winning Madagascar Milk 58%. This rather sophisticated hollow figure, complete with its own nest, makes the perfect Easter gift for the true chocolate connoisseur. 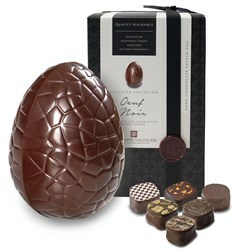 A thick-shelled dark chocolate Easter egg filled with dark chocolate, soft centred, peanut butter mini truffle eggs. This beautifully presented, luxury boxed Easter egg by Prestat contains mouth watering dark, milk and white chocolate truffles with a 71% dark chocolate shell Easter egg made from a blend of single origin cocoas. © 2018 Chocolate Trading Company Ltd.